Today’s rapidly changing environment provides both challenges and opportunities for philanthropy and nonprofit organizations in New Mexico. 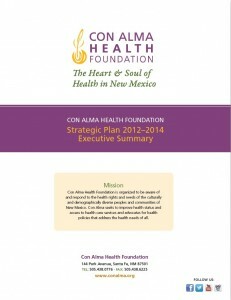 Issues impacting Con Alma Health Foundation’s strategic planning included our state’s changing demographics, the economic environment, health care and health care reform, as well as changes affecting governmental and nonprofit sectors. Download a copy of the Executive Summary by clicking on the picture of the document.